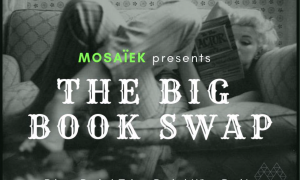 Mosaïek warmly invites you to our BIG BOOK SWAP. If you’re looking for a chill place to hang out and find some new exciting books to read, join us @THE LAB on 17 March, 15.00. Bring a book that you’ve read and/or that you don’t mind parting with. Bring your lovely presence. Swap your book out for another. Profit.